Wondering how to move from one place to another without breaking your bank? Want to ease your moving process? If So, here are some useful house moving tips from our moving experts to help you avoid moving day chaos. - Get quotes from professional moving experts for a stress-free move. - Arrange the car transport if you are not taking help of house movers. - Estimate the total volume of your items to give the removal company a vague idea. - Make a budget for your moving expenses. Also create a folder having documentation, receipts, and quotes. - Maybe it’s the best time for a Spring clean: de-clutter your belongings to decide which one you want to donate and sell. - Use all your frozen and perishable foods. Create a meal plan to empty your freezer, fridge, and pantry by the time moving day arrives. - Research around your new home to locate the basic amenities. - If you are renting then confirm your moving date to your landlord. These are the days when you need to perform your important moving steps. - By this time, you have to be clear with the removalist company and lock-in a moving day and time. - Secure packaging always take time, so start packing soon or organize a professional packing service. - Make a checklist of all the special precious and fragile items. - Organize a protective packaging and wrapping materials. - Read instructions for moving large appliances such as fridge and washing machines. - You should talk with your removal company to know about their moving insurance options and the procedure to make a claim. - Notify the tax office, electoral commission and your contacts about the change of address. - Inform your utility providers and arrange disconnection and reconnection. - Backup all your important devices and file securely. 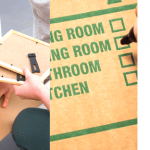 - Create a floor plan to ensure all your furniture fits. By this time you should be checking if most of your work is done or not. - Give your new home a small visit and inspect the surroundings. - Collect your keys from the property agent/landlord. - Confirm your address details to the removal company for both the house. - Arrange a parking for the removalist’s vehicle. - Re-check with your utility company about the reconnection of services to the new address or about the disconnection. This is the day to do your last minute odd jobs. The checklist is smaller for this day comparative to the other days. - Keep a “Moving Day Kit” that has all basic items like a bottle, phone charge, first-aid etc. Hope these tips will make your house moving process simple and save your time and money.